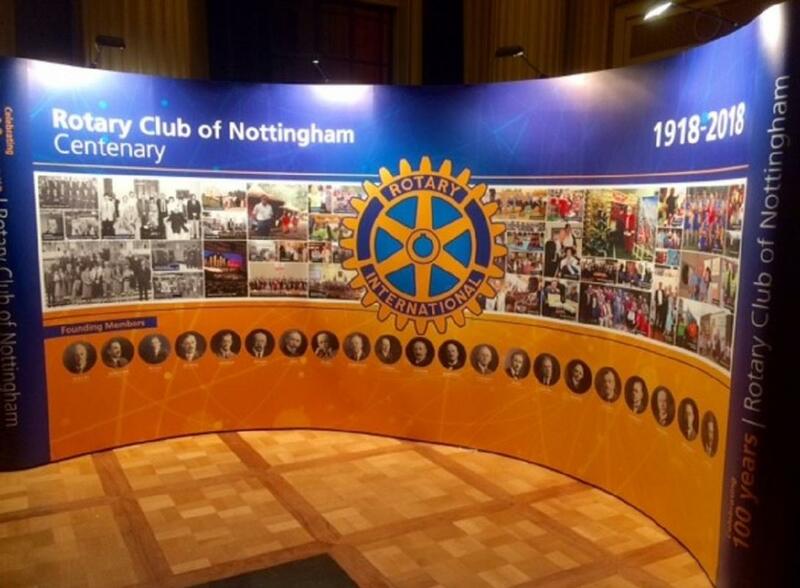 Two enormous coloured display banners showing the 100 year history of Nottingham Rotary Club took centre stage at a civic meeting hosted by the Lord Mayor, Councillor Michael Edwards earlier this week. The 20-foot long display depicted event highlights over the century and another showed the Nottingham Rotary family tree. This included the many daughter, grand-daughter and great grand-daughter clubs that Nottingham have started across the region. And representatives from many of the clubs started by Nottingham were present to join in their celebrations. Making the banners was very much a family affair too as Tony Barnett, Managing Director of John E Wright specialist printers who produced the banners is a member of Nottingham Rotary Club as was his father John Barnett before him. Councillor Michael Edwards, a keen student of Nottingham history told the guests that he was surprised to learn how much Rotary clubs had contributed to the community locally and congratulated them on delivering on their motto Service Above Self. During the evening he also learned that the first meeting of the club was hosted by the then Mayor and Sheriff. Initiated the Dolly Parton Imagination Library Scheme in Nottingham that has provided almost 100,000 free books to under-fives to help raise literacy levels in the city. 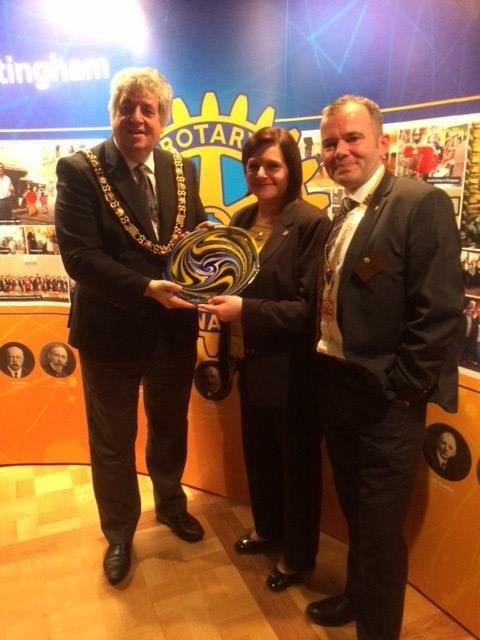 Nottingham Rotary club is part of a world-wide service organisation with 9 clubs across Nottingham. Its aim is to combine an active social life, friendship and business networking with service to the community at home and abroad. Pictures show 100 year history of Nottingham Rotary Club in Pictures and Lord Mayor Councillor Michael Edwards receiving a decorative plate from Rotarian and glass designer Ingrid Pears and Club President Paul Jones to commemorate the event.